Add the olive oil, vinegar, Dijon and minced garlic together in a small bowl and whisk until well combined. Season with fresh cracked black pepper and salt to taste. Combine tuna, diced cucumber, green onions, lemon juice, zest, dill, mayonnaise, salt and pepper in a large bowl and stir well. Toss the mixed greens with some vinaigrette to taste, then arrange on 2 plates and top with a generous scoop of the tuna mixture. 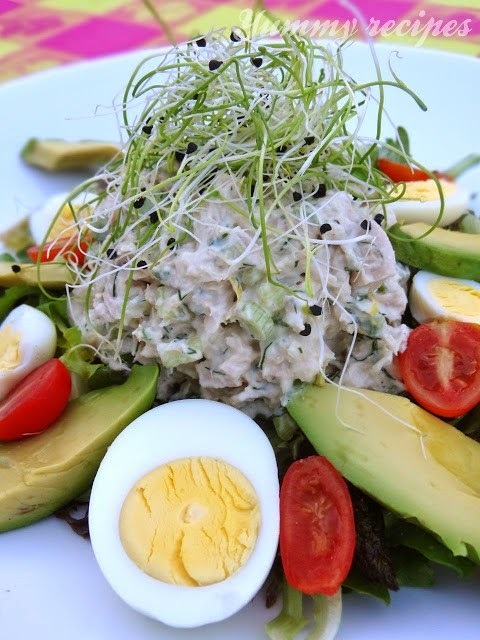 Top with a handful of onion sprouts and garnish with sliced avocado, tomatoes and hard boiled eggs. Season with Maldon salt and fresh ground black pepper to taste and drizzle with more vinaigrette if need.